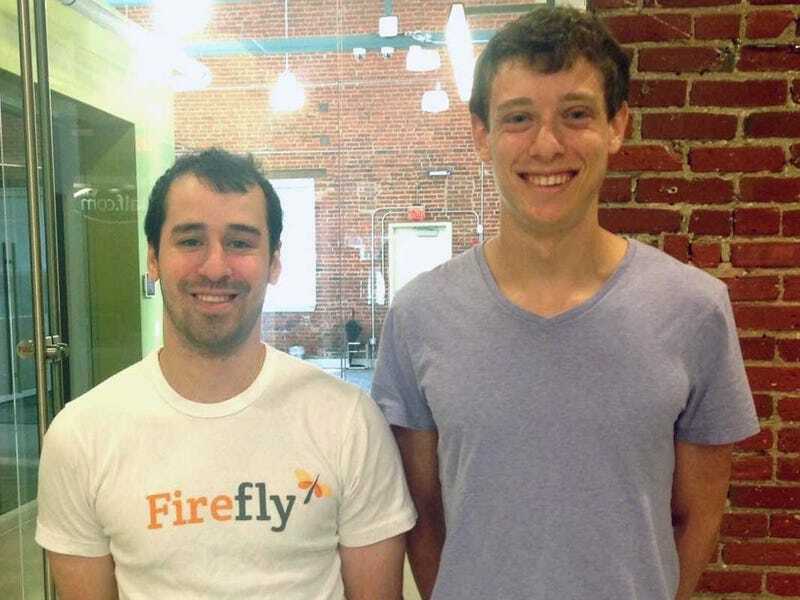 Justin Meltzer (L) and Dan Shipper (R) run a profitable startup, Firefly. Dan Shipper, 22, is going into his final semester at University of Pennsylvania. Unlike most seniors, Shipper doesn't spend his nights fretting about finding a job or endlessly partying. He is already self-employed. Much of his spare time is spent running a tech business that's more or less bootstrapped: Firefly. He and his partner, Justin Meltzer, raised $20,000 from First Round Capital's Dorm Room Fund. This isn't their first startup either. The pair met at a coffee shop during Shipper's sophomore year (Meltzer is one year older), where a group of students interested in tech entrepreneurship gathered on Fridays. Their first joint venture was Airtime, a company they've since discontinued. Both are technical; Shipper has been coding since he was in fifth grade. Meltzer taught himself five years ago. Firefly is a 2-person startup (three if you count the intern) that has only been around for 10 months. It enables customer service reps to share their screens with customers without requiring them to download any software. Its 6,000 customers either pay $25-99 per customer service rep or a fixed monthly rate if it's a large organization. Today Firefly announced a partnership with chat company Olark that accounts for 5,000 of its 6,000 clients. Despite Shipper splitting time between class and "real" work, Firefly is profitable. It's "well into the 6-figures in annual revenue," says Shipper. Most college kids in that position would be throwing keggers and buying friends rounds at the bar. We asked Shipper what he does with all the money he earns, how he manages his time, and what his plans are when he graduates in December. The following is a lightly edited Q&A. BUSINESS INSIDER: Firefly generates 6-figures per year. What does a college kid ? sorry, "young adult" ? do with all that extra cash? DAN SHIPPER: Yes, well into the 6-figures. But I can't tell you exactly where in the six figures. We just plow the money right back into the business. We pay ourselves a little bit of a salary but most of it goes toward expenses. Lawyer bills when you run a company like ours can get high. It's not like all of this is profit. We are pretty frugal with our money. BI: So Firefly is profitable? DS: Definitely profitable. It's just the two of us and an intern. BI: What do your friends and classmates think of all this? DS: They think it's cool, especially when we tell them the number of customers we have. Before we were successful they stopped listening when we said "customer support software." BI: What is your typical day like? DS: I go to classes during the day, which start between 10 and 1. After that I'm in the office [First Round Capital's in Philadelphia] until midnight. I have a full course load and I'm graduating early; I took more classes than I had to so I could graduate in December. BI: Do you have a social life? DS: Yah, I go out some. BI: Do your friends see the fruits of your labor? AKA do you buy them rounds of drinks?? DS:? [Laughs] Maybe when we get to 7 figures in revenue we'll do that. BI: But you're a college kid making tons of money. Even if you paid yourself $30,000 a year that'd be a fortune for a college student. You never share the financial love with any friends? DS:?We're not paying ourselves even close to $30,000.? BI: Justin, what was your schedule like? JUSTIN MELTZER: I had the same schedule as Dan. I graduated early but after class we'd meet and work on the business. DS: We'd meet in my lounge in the dorm. People were running around; chairs were uncomfortable. Now at First Round we have things like free snacks and a skeeball machine. Our office is closer to my house than any of my classes. BI: With such hectic schedules, how did you manage to close a big partnership like Olark? You said that deal alone increased your customer base from 1,000 to 6,000. JM: Dan got an intro to them. We've been working really hard on it over the last year to get it done. We thought Olark would be a natural fit. DS: I realized Olark was a Y Combinator [a Silicon Valley startup accelerator] company. I asked another Y Combinator grad, Jason Freedman of 42Floors, for an intro. He set it up. BI: What's the plan when you graduate? To join Justin full time? Will you relocate Firefly to New York? DS: The plan is to keep working on Firefly full time. We're not sure where we'll be located. We both really, really like Philly.